17 years ago, a little film called The Blair Witch Project redefined the found footage horror genre and set the world alight in 1999. A sequel, Book of Shadows did little to build on what the film offered in the first place (except to expand out some ideals of the first) - and now 20 years after the first film's found footage was shot, a bait and switch threequel from directing wunderkind Adam Wingard (You're Next, The Guest) was unveiled at San Diego Comic Con. Previously masquerading under the title The Woods, Blair Witch once again heads back into the woods of Burkittsville and into the world of urban legend. This time, it's due to James (Allen McCune) whose sister Heather Donahue went missing first time around. When footage purportedly of Heather shows up on YouTube, James contacts the poster and asks to meet. This leads to 4 friends, including one lifelong friend and documentarian Lisa (Hernandez), heading to the woods to see if they can find the original house and consequently, James' sister. A lot's changed since the first Blair Witch arrived on the scene with its lo-fi skills and reasonably high concept game-changing ethos - and Wingard's smart enough, and also crippled enough, to embrace that. This one has wearable tech (ear cams) and utilises a drone and walkie-talkies; there's talk of the dark net, and a hint of Creepypasta's Slenderman thrown in as well, but at its heart, this film is as old-fashioned and as familiar as the first one. 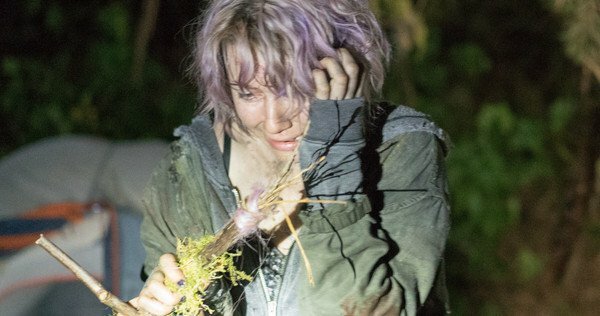 In many ways, a lot of the film feels like the first Blair Witch, slightly re-hashed and done again; there are cracks and noises in the woods, there are those stick figures, and there's the old pesky witch again. But just as the jaded blanket of cinematic familiarity threatens to strangle your idea of what this film's setting out to do, Wingard changes it up a little and throws in some effective jump scares that you know are coming but arrive with bone-crunching glee, before a distinctly claustrophobic finale. If anything, Blair Witch plies deep into a world we now inhabit. It's a world where the internet distorts and dissects urban legends, where internet grainy films are pored over endlessly and debated in reddit threads or forums; it's a world that's got too savvy for cheap thrills. And that was essentially what the first Blair Witch film offered - a lo-fi grainy hand-held take on a ghost story told around the camp fire. In among the truly impressive and dissonant, distorting soundscape, Wingard cleverly evokes that sense of questioning and plays on those down-the-rabbit-hole moments to provoke some thrills and expand some of the mythology that many may feel adds a sheen of freshness after the usual mundane set up antics. And yet, if you go down to the Woods today, you're in for a familiar surprise in many ways, which is ironically, both Blair Witch's strength and its weakness. It mines some effective thrills, and some genuinely unsettling moments, but it can't quite live up to the power of the first and in parts, feels like a re-tread of the iconic horror. Ironically, Blair Witch is hampered by the first film's collective cultural importance to cinema; Wingard comes close to replicating parts of that film's success, but it can't help but escape its feeling of deja vu when the lights go up.